As we travel through a quiet forest, it is hard to know how many creatures are watching us, lurking just out of view, motionless and undetectable. 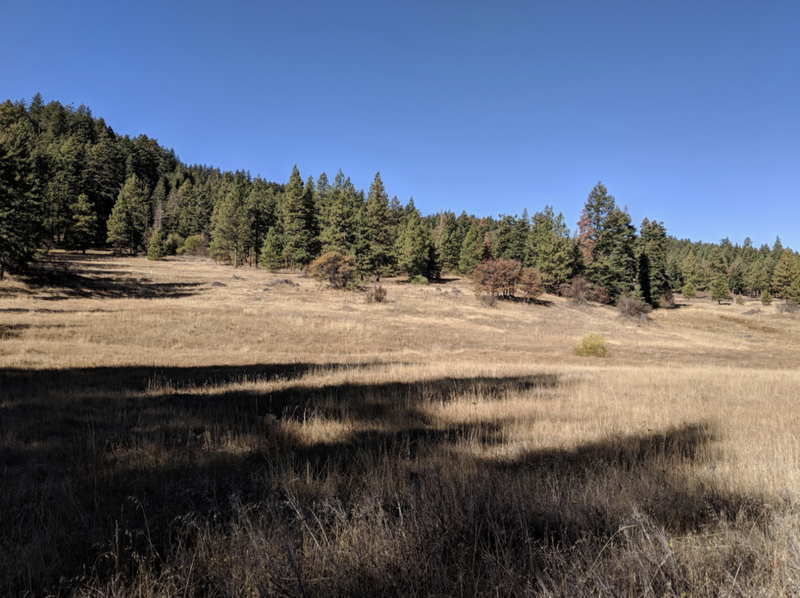 On October 12 and 13, the Friends of Cascade-Siskiyou National Monument examined one of those creatures that, though rarely seen, has captured the interest and admiration of so many. That creature was the great gray owl, which breeds in the Oregon portion of the Monument. 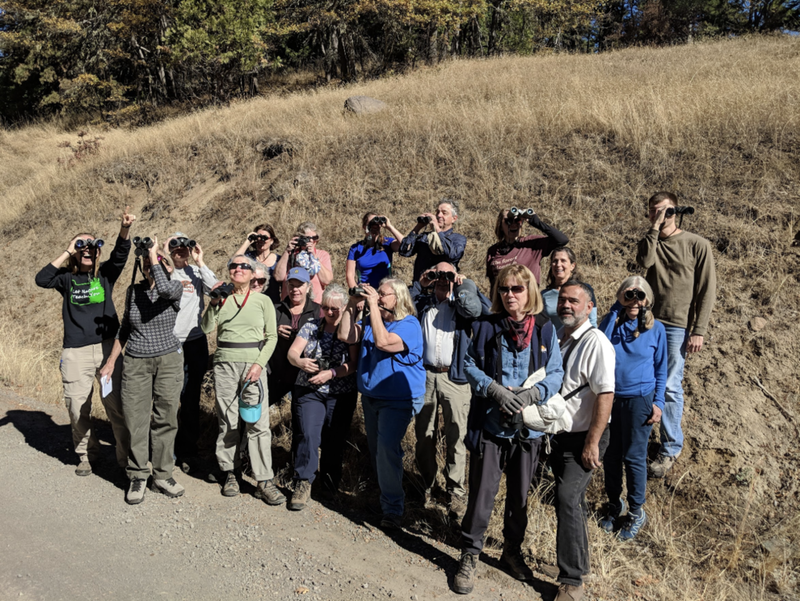 Harry Fuller, author of three natural science books including Great Gray Owls of California, Oregon, and Washington, helped us to glimpse into the world of this charismatic predator during our final Hike & Learn of the 2018 season. On Friday October 12, more than 70 birders, bird-lovers, and eager learners gathered in the Ashland Outdoor Store to learn more about great gray owls in the Monument. 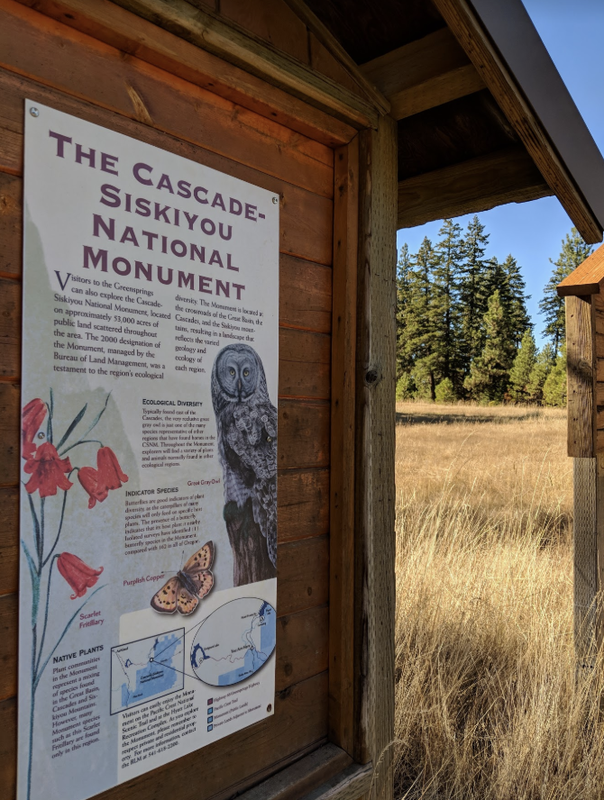 Harry informed us that many birds that call Cascade-Siskiyou National Monument home are living on the “edge:” the edge of two habitats, the edge of their range, or the edge of extinction. For great gray owls in particular, all three of these may be true. They prefer to inhabit areas where dense forest meets open grassland. The population in Cascade-Siskiyou National Monument is the southernmost population of great gray owls in the world. And, if suitable habitat continues to disappear, these birds just may be pushed over the edge. The following morning, Harry led us on a birding expedition with stops on the way to Little Hyatt Reservoir and along Soda Mountain Road. Despite the fact that the Cascade-Siskiyou National Monument harbors the largest population of great gray owls in the continental United States (there are more than 300 individuals in Jackson and Klamath county), we were unable to spot one during our outing. However, we did see plenty of other birds, including Lewis’s woodpeckers, western bluebirds, an American kestrel, a dipper, and a group of busily foraging Clark’s nutcrackers. To read more about our Saturday trip, visit Harry Fuller’s blog: https://atowhee.blog/2018/10/14/nutcracker-sweet-2/. The edge between forest and grassland makes prime habitat for the Great Gray Owl. A western bluebird as viewed through a spotting scope. Leader Harry Fuller scans for an elusive dipper across Little Hyatt Reservoir. Group photo along Soda Mountain Road.